Great Yarmouth, Yarmouth to locals, situated at the mouth of the River Yare and founded by the Angles, is much older than Norwich. By the time of the Domesday Book, in 1086, it had become a settlement with a population of a few hundred. In the Middle Ages the town's prosperity was based on herring fishing which for decades continued to be a major food source and industry. In the 19th century the town became a centre of tourism when the railway was built in 1844. 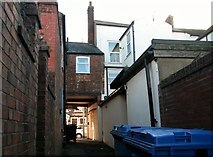 Until the 19th century, building was only permitted within the medieval town walls and the limited space hence led to rather cramped spaces in that houses were built as closely together as possible. The origin of the rows is not clear. 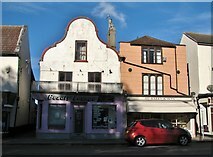 It is thought by some that the rows may have developed from a Scandinavian type of street layout (similar street systems are recorded from Kirkwall, in Orkney, Birka in Sweden and parts of Hanseatic Bergen in Norway) and indeed many street names in the town are of Scandinavian origin, but others have suggested that the rows are a variant of classic medieval waterfront development, where plots are lengthened by constructing wharves out into the river. Parcels of land known as rengatae (ranges) are documented to have existed in the late 12th century, and evidence suggests that the rows proper already existed in the early 13th century and had been established by 1280, when the first mention of a row was made in a reference to le spitalrowe (Hospital Row). A manuscript dating from 1286, part of which has been lost, lists 99 rows as having existed in the southern part of the town. The playwright and poet Thomas Nashe (ca 1567-ca 1601) mentions 140 rows, a number which is confirmed by the historian Henry Manship who in 1619 completed his history of the town. Dr Cooper, the Minister of Great Yarmouth, in 1784 recorded 156 rows. 150 rows are documented to have existed at the beginning of the 19th century but as some were blocked up or absorbed into neighbouring buildings, and new ones created, this number was by no means constant. Some of the rows were cul-de-sacs, ie they had one entrance/exit only. They were called half rows and numbered accordingly. In the Middle Ages, the layout of the town was based on three main streets all running north-south, with the buildings between them arranged in blocks and lanes or rows arranged on both sides of alleyways running east-west, dividing them. 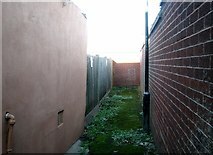 The rows at that time occupied much of the land inside the town's walls. 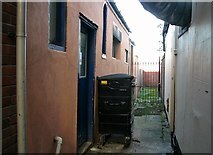 To begin with, both rich and poor people lived there side by side, but when during the 19th century wealthier families gradually moved out, their houses were subsequently divided up into smaller properties, and many of the poorer row dwellers inhabiting these small houses took in lodgers to supplement their income. 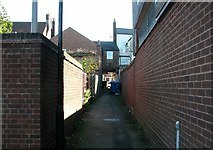 The rows were all aligned in an east-westerly direction and separated by narrow lanes paved with beach pebbles, frequently with open gutters and sloping downwards gently in one direction for rainwater to run off and sewage to be swept away but also often leaving the ground rather muddy. Salt water pipes for flushing stood at strategical locations. By the the 19th century most rows were paved, some full width, but many down the centre only. Because of the extreme narrowness of many of the rows it had been decreed as early as in 1618 already that all doors had to swing inwards or else the constables would charge a fine of 5 shillings and nail the doors shut until the owner complied. For centuries the rows remained the only means of traversing the town from east to west, and only after the first two rows (Row 68 and 69) were demolished in 1813 to make way for a road (today's Regent Street) which linked South Quay and King Street, a thoroughfare wide enough for transporting goods was finally available. Many rows had wooden posts or rails fitted to prevent damage caused by carts. 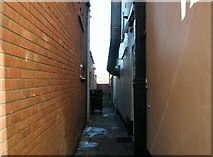 More often than not, though, the alleyways were too narrow for a horse and cart to pass through. A special cart, called a troll cart or Harry carry, had for this reason been designed as early as the 14th century to facilitate the transport of goods along these. Troll carts were long and narrow, and with their two wheels placed underneath the carriage (so that they did not catch on buildings and damage the brickwork) resembled oversized wheelbarrows, albeit horse-drawn. All the rows were given names derived from local property owners or tradesmen, or from the pub on the corner. Over the centuries many of the rows had, however, acquired a number of successive names and mirroring the changes in a row's population its name also often changed. In 1804 the authorities therefore decided to assign each row a number, allocated from north to south, before things would become even more confusing, although Broad Row, Market Row and Priory Row never received a number, presumably because their names were not as susceptible to changes as any of the others. 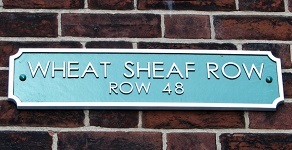 In the summer of 2018, following an initiative of the Great Yarmouth Preservation Trust, the 62 rows parts of which remain received name signs. 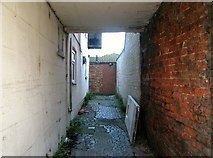 Clearance of the worst of the rows began in 1933, when the town council declared the area between Rows 17 and 21 to the north and the midline of Rows 28 and 27 to the south a clearance area and made a compulsory purchase order. Altogether 135 houses accommodating some 144 families, all in all about 600 people, were affected. 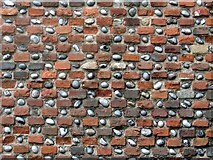 In 1936 the Society for the Protection of Ancient Buildings and the Norfolk and Norwich Society proposed that about a third of the rows should be preserved. The outbreak of WW2 in 1939 and intense German bombing raids notably in 1941, however, destroyed or damaged beyond repair large areas of the old town with the area most affected being that of the rows situated between South Quay and Middlegate Street, and by the 1950s most of the remaining row houses had been demolished to make way for new housing and shopping developments. The entrance passages to many rows can however still be found along South Quay, Market Square, King Street, Howard Street, Middlegate Street and Northgate Street, and many of the rows' network of alleyways still exist and provide convenient shortcuts around the town today where examples of early doorways, windows and walls can still be seen. The whole area of the rows is now covered by conservation orders. Row 1 (Rampart Row aka Ramp Row) was the longest of all the rows (ca 135 metres). The houses, described as hovels, were demolished in the 1860s and Rampart Road, which links Northgate Street and North Quay further to the west, was built on the site in 1902. 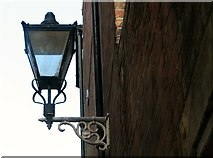 The row's name was derived from its location immediately within the town's wall although in some old deeds it is occasionally mentioned as Common Ramp. 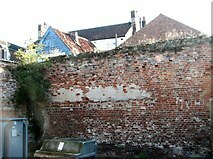 The row was demolished when the road was built, and as is evidenced by an old photograph, one of the wall's towers had been converted to stabling. CJ Palmer in his Perlustration records that in 1641 a committee had been appointed to enquire who caused the tumbledown cottages and almshouses supported by wooden struts to be erected in the row, and also that the large archways in the town wall, some more than two metres (7ft) deep against which the houses had been built, were most useful to the inhabitants many of whom apparently used them as bedrooms. Despite the unfavourable living conditions some of the row dwellers reached advanced ages, such as Maria Bowles, who died in Ramp Row in 1869, aged 91. 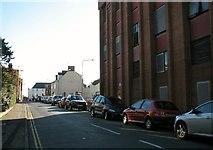 Row 2 (Black Horse Row) ran from North Quay to Northgate Street and was named after the Black Horse public house located at its north-east corner. 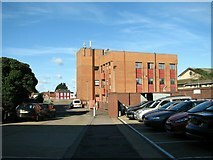 It was also known as Bird in Hand Row and (in 1925) as East and West Flegg Row. A short north-south passage turning off this row linked it with Row 3, which ran parallel in the south. The passage is still in place but the row houses are long since gone. CJ Palmer records that the row was almost as long as Row 1. 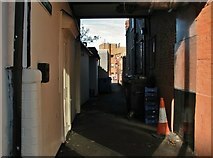 Row 3 (Boulter the Baker's Row aka Doughty's Row) ran from Northgate Street to Laughing Image Corner adjacent to its western end. 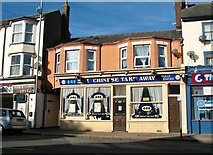 It was named after Boulter's bakery which until 1865 was located at its north-eastern corner. About halfway along the party walls of some of the row houses appear to still be in place, hidden behind a high fence. Palmer reports that in the process of sinking a well the workmen struck a layer of sand about 4½ metres down and embedded in it found the remains of a crudely constructed boat. 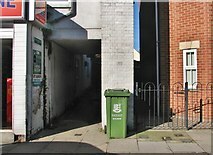 Row 4 (Thornton the Grocer's Row) ran from Northgate Street to Laughing Image Corner and was named after Thomas Thornton, whose shop was located at its eastern end. At various times the row was also known as Ecclestone the Grocer's Row, Rolling the Baker's Row and Wiltshire Arms Row (after a tavern located at the north-eastern corner. 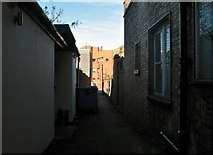 The row was demolished and only a short section of the alleyway is still in place at the eastern end. CJ Palmer records that an old house with round windows, locally called "cowmouths", was situated in this row and also that a large half-timbered house had been converted into a place of call for cadgers and tramps.